The world famous manufacturer of crystal glass art, Lalique, traditionally produced prototypes from modelling materials – and moulds from cast iron and tool steel – on a 3-axis machining centre at its Wingen-sur-Moder factory in the Alsace region of France. The process was becoming increasingly costly, particularly for producing larger items in the company’s range. A Hermle 5-axis machining centre is now used instead. 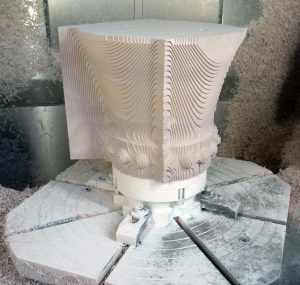 Machines from this German manufacturer are supplied in the UK though Kingsbury, Gosport, which contacted Christian Vollmer, head of mould and tool making at Lalique, to find out more about this unusual application. Each year, Lalique manufactures around 60 new multi-part moulds, many of which are extremely complex. Luxury perfume bottles, jewellery, drinking glasses, decanters and bowls remain popular, but there is a trend towards larger crystal glass products. They include exclusive individual items, such as sculptures, tables, lamps, door handles and wall coverings for furnishing houses and ships. Due to the size and often complex shapes of the end products, the moulds can be in as many as six parts or segments, each of which has to be machined accurately to replicate the design. In addition, the junctions between the mould segments have to be very precise to minimise the finishing and polishing required to eliminate any discernible lines in the moulded piece. 5-axis milling was deemed to be the way to go. After a relatively long evaluation period and cutting trials, Lalique chose a Hermle C 30 U 5-axis machining centre. Not only is the machine used for high precision roughing and finishing of moulds in one set-up, but cutters held in HSK-A63 toolholders are also used to add decorative filigree features and textures directly onto the lead crystal glass after moulding. To achieve this level of precision on a brittle material like glass using a machine of nominal half-metre-cube capacity, a high degree of stiffness is needed in the moving elements to minimise vibration. Spindle speed is up to 18,000 rpm and the machine has a 32-pocket tool magazine so that sufficient cutters are available to fulfill all machining requirements in one set-up. Christian Vollmer, Head of Mould and Tool Making.